This smaller mounted double sided flange porcelain sign is for De Luxe Motor Coaches. The sign is red and white and has a lot of text filling it up. 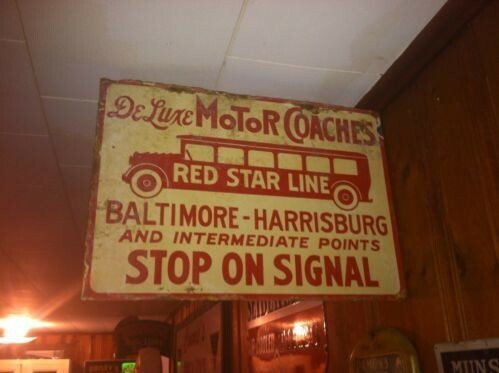 The text reads “De Luxe Motor Coaches Red Star Line Baltimore-Harrisburg and Intermediate Points Stop on Signal. The sign has a bus illustration.